Sailing | Do-It-Yourself Advice Blog. Our sail repair posts and videos have been so popular that we recently decided to go all out and create a comprehensive video series on the topic. We filmed all of our techniques as we inspected and did regular maintenance on the sails from Sailrite founder Jim Grant’s Islander 37 sailboat. The series is broken into 13 videos and walks you through a variety of different repairs as well as inspecting and folding your sails. Watch all 13 videos or jump right to the one you need! Inspecting Your Sails for Next Sailing Season: For seasonal sailors, the end of sailing season is a good time to inspect your sails so you have all winter to make repairs and get them ready to go for the spring. In this video, Jeff Frank, our sail designer, inspects the sails for the Islander 37, sharing as he goes what issues to look for and how to approach common fixes. How to Replace a Sail Window: If the window material in your sail is cracked or just hard to see through, we’ll show you how to replace it without causing performance issues in your sail. This video also demonstrates how to add a brand new window to a sail. How to Repair Sail Luff Tape: This video will show you how to repair a rip or a tear in your sail’s luff tape without having to replace the entire tape. Also included is a quick fix for when the end of the luff tape is shredded at the head of the sail. How to Restitch Damaged Sail Seams: It’s not uncommon for the seams on your sail to fail from UV damage, stress or abrasion—even new sails have this problem. This video is a quick demonstration of how you can fix those seams that are coming apart by sewing right over them. How to Patch Holes & Rips in Sails: If you find you have holes that need patching after your sails have been in storage or from a rough day on the water, this video will walk you through the process step-by-step. How to Remove a Spur Grommet: If the grommets on your sail are corroded and failing, you can easily remove them and replace them with new grommets. This video shows you how to use a Dremel tool to remove an old spur grommet and how to set a new one. How to Repair a Sail’s Batten Pocket: This video demonstrates two different batten repairs. In one, we replace the elastic at end of the batten pocket and in the other repair we replace the Dacron on the pocket because the batten has chafed through the original material. How to Repair a Sail’s Spreader Patch: A spreader patch is used in sails, especially genoas, to combat damage that the mast’s spreader tip can cause to the sail when they brush against each other. This type of damage is common and on our sail it was pretty extensive. In this video we demonstrate how to remove old patches, replace the damaged sailcloth and install a new Insignia Dacron Spreader Patch. How to Repair a Leechline Cleat or Tensioning Device: This video will show you how to remove a broken Leechline clamcleat and how to install a new one. We also replace worn out Velcro on a Velcro tensioning device. Re-cutting a Sail’s Leech and Foot Edge: The genoa on Jim’s Islander 37 is an older sail, and when used it was clear the leech had stretched out because it was fluttering terribly. To get a few more years out of the sail and improve performance we decided to cut down the leech and foot to provide a better shape. How to Re-Install a Sail’s Corner Ring: When cutting the leech and foot of the sail to enhance the shape the sail’s corner ring had to be removed. This video will show you how to use Dyneema webbing to install a new D-Ring at the clew corner. How to Fold a Sailboat Sail: This video will show you the proper techniques for folding (or flaking) a mainsail, a dinghy sail and a genoa sail. Using the Speedy Stitcher to Sew Webbing and Canvas: In this bonus video we demonstrate how to use the Speedy Stitcher Sewing Awl, which is a handy tool to use for sewing projects and repairs when a sewing machine is not available for practical. To demonstrate the tool we also show how to make a “dog ear” to help the sail reach the tack pin. We hope these videos will be a help to you the next time you need to make a repair on your sails. You can find all the materials needed for your sail repair including the Sailrite Ultrafeed LSZ-1 Sewing Machine at Sailrite.com. Did you learn anything new from these videos? Share your thoughts on this new video series in the comments. We’ve discussed before the various considerations that go into selecting the best fabric for your cockpit cushions. Today we’re going to take that conversation a step further by looking at how the decision making process for your cockpit cushion fabric compares to choosing a fabric for your cabin. Each area of your boat has its own unique challenges and concerns and we’re going to break down what to look for in a fabric for your cockpit and cabin cushions. The cockpit is exposed to much more moisture and sunlight than your cabin cushions so creating cushions with good longevity in the elements is the main goal of selecting a cockpit cushion fabric. Look for a fabric with excellent UV resistance and good water resistance. The exact level of water resistance in a fabric can vary based on what foam you intend to use with it. For example, closed cell foam can be covered in any fabric, because the foam itself is waterproof, but Dry Fast Foam is designed to let water run through it, so covering it in a waterproof vinyl isn’t the norm. For cockpit cushions we recommend using a marine vinyl like Morbern Seabrook or Naugahyde All-American; a weatherproof woven synthetic like the acrylic Sunbrella Marine Grade fabrics; or a sturdy vinyl mesh like Phifertex Plus. Since your cabin is more protected from the elements than your cockpit, moisture and sunlight are lesser concerns for cabin cushions. The two main things to think about when selecting your cabin cushions are preventing mildew and feeling comfortable. To keep mildew at bay, avoid natural fibers like cotton or any cotton blends. Choose a synthetic material instead like acrylic, olefin or polyester. These fibers won’t allow mildew to grow. Also, you won’t need a waterproof fabric in your cabin, but depending on how you use your boat, you may want a water resistant fabric, if your cushions get wet from time to time. Comfort is definitely the second biggest factor for cabin cushions. If your boat is your home or home away from home, you’ll want to feel relaxed and cozy aboard. For many, this means cushions with a softer feel than can be found on traditional marine grade materials. Breathable woven fabrics or engineered faux leathers are popular for boat interiors. Examples of these fabrics include: Sunbrella Upholstery, Geobella and Ultraleather. You can also use a home décor fabric if it’s made from synthetic materials and has a high double rub rating (we recommend over 50,000 double rubs). These guidelines still offer a lot of room for personal style and preferences, and hopefully they will free you up to choose fabrics that you love and that function perfectly for the spaces they live in. If you’re ready to start making new cockpit or salon cushions, be sure to watch our how-to videos on each of those projects to get you started. You’ll also find all the fabrics discussed here and many more at Sailrite.com. What do you look for in cockpit or cabin cushion fabrics? Share your opinions in the comments! It’s not uncommon for sail battens to rip through their pockets and sometimes they even go shooting off into the water. As distressing as this might be to witness, it’s a pretty straightforward fix to make. Today, as a part of our Sail Repair Series, we’re going to show you how to fix your sail when a batten pocket rips including demonstrations of how to install three different types of batten pockets. The first step to repairing your batten pocket is to inspect the rip and see which part of the sail is torn. If only the pocket is ripped, you’ll want to remove the pocket and replace it with a new one. If the sail itself ripped you’ll need to remove the pocket, patch the rip on the sail, and then install a brand new pocket. If your batten has elastic in one end and the elastic has gone bad, it is possible to remove only that end of the pocket, install new elastic, and then add a new pocket portion that connects with the original. When it’s time to create your new batten pocket, you’ll want to take a close look at the other intact pockets on your sail. There isn’t a set standard for how to make batten pockets, so you’ll want to model your new pocket after the others. Common types of batten pockets include: triangular batten pockets, which are wider at one end to keep the batten more secure inside; standard batten pockets, which features a straight shape and an elastic strap in one end; and sewn-in batten pockets, which have the batten stitched to the sail at one end. In this video you will see how to patch the hole in the sail and how to repair a permanently sewn in batten pocket. If your sail has another type of pocket, you can follow the patching instructions in this video but then refer to our How to Make Triangular Batten Pockets video or our Making a Standard Batten Pocket video to see how to craft two other pocket styles. Don’t miss our first post in our Sail Repair Series, Patching Small Rips and Holes. You can find all the tools and materials needed to do your own sail repairs, including replacement battens, at Sailrite.com. Have you ever had to do a repair on a batten pocket? Share your experiences and techniques in the comments. Here at Sailrite, we want you to be well-prepared, self-reliant sailors. Rips and tears happen in sails, battens fall out, and hardware comes free. With the right knowledge and tools, you can make repairs and fixes to your own sails, both in emergency situations and carefully on the docks. We’re going to share a multi-part series here on the blog with repair techniques for fixing the most common problems. Today, we’re focusing on small rips and holes. We’re defining a “small” rip or hole as a hole 6 inches or under and a rip 12 inches or under. Small rips and holes like this can easily be patched. If your sail has a large rip, you’ll want to consider why the rip occurred before patching it. If the rip was caused by damage, you can use a large patch or even replace the entire panel of the sail. If the rip was more spontaneous, it’s likely that your sailcloth is getting worn and it might be time to consider replacing the sail altogether. The instructions below are for making permanent repairs to your sail. If you’re in an emergency situation and you need a temporary repair until you can take the time to sew a proper patch, we recommend using adhesive backed repair tapes. Sailrite stocks Dacron, Laminate and Ripstop repair tapes that you can affix to both sides of your rip as a fast patch. You can also use adhesive-backed Insignia Dacron fabric for patches, too. Patches should be sewn on later to better secure and more permanently fix your tear. For your patch fabric, use the same fabric (or a slightly lighter weight) that your sail is made out of. Non-adhesive-backed tapes can be convenient for patch applications. Their smaller size makes them easy to work with and easy to store. Cut a patch that is 1” larger than the rip on all sides. Using Seamstick basting tape, baste the patch in place. If you’re repairing a rip, try to keep the ripped sides as close together as possible. Sew around the perimeter of the patch with zigzag stitches. Turn the sail over. Carefully cut out the frayed, ripped edges of the fabric so a clean edge is left next to the stitches. Doing this step last helps to maintain the shape of your sail. Here’s a video that shows this same process being done on a rip in a spinnaker. Since the rip is close to the edge of this sail, you’ll notice we add extra stay tape along the edge of the sail to nicely finish that side of the patch. You can find all the necessary sail repair tools and materials, including our Sail Repair Manual written by Sailrite founder, Jim Grant, at Sailrite.com. Be sure to keep an eye out for the subsequent posts in our sail repair series that will be coming out in the coming months. Subscribe to the blog to be sure you don’t miss a post! 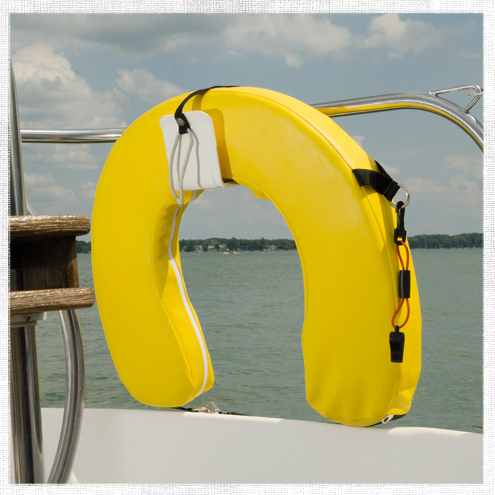 An important piece of boat safety equipment is an easily tossed floatation device like a throw ring or horseshoe buoy in case of a man overboard situation. To keep these safety devices ready-to-go all the time, they often are sitting out exposed to the sun. If your horseshoe rescue buoy’s vinyl covering is starting to look worn out, you can reuse the foam inside and sew up a new cover for it. Most safety buoys like this are covered in vinyl. We decided to also use a vinyl fabric for our horseshoe buoy cover, choosing a Naugahyde Universal fabric in yellow. You’ll want to use a bright color, like yellow, orange or red, so your buoy will be easy to see in the water. You could also use another type of vinyl or even other water-repellent fabric like Sunbrella Marine Grade if you wanted. Sewing this horseshoe buoy is very similar to sewing a box cushion, just with a few more curves. If you can sew a box cushion, you can sew a new cover for your horseshoe rescue buoy. 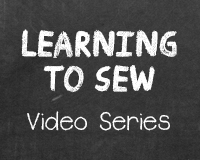 In this video you’ll learn how to pattern the fabric, create the zipper plaque, add the webbing and D-rings, and assemble the cushion cover. Find all the materials needed for this project, including the hardware and a large selection of vinyl fabrics at Sailrite.com. Have you ever re-covered a buoy? Do you have any tips to add to this process? Share your suggestions and ideas in the comments! You may recognize Desiree Golen from videos we’ve shared on our Facebook page. We heard about Desiree, her boyfriend Jordan Wicht, and Project Atticus just as they were starting to refit their boat a couple of years ago. We admire their ambition and DIY spirit and we thought you would too. Sailrite is sponsoring Project Atticus as they learn how to sew canvas and sails. I recently chatted with Desiree about their ongoing adventure and the nature of DIY. Here is their story. The DIY spirit has grabbed ahold of Desiree Golen and Jordan Wicht and it’s not letting go. 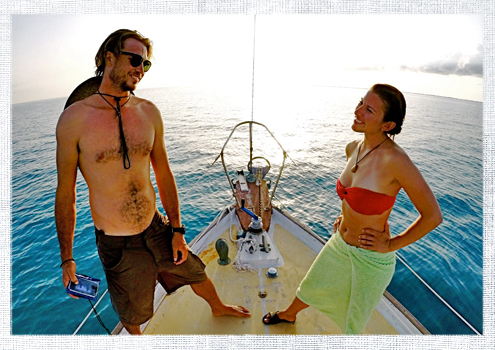 This young couple is the dynamic duo behind the blog and video series, Project Atticus, where they are documenting the refit of their 1963 Allied Seawind and will ultimately share their adventures sailing around the world. The motto of Project Atticus is “know your world” and that is exactly what Desiree and Jordan intend to do. For Desiree, the desire to travel started at a young age. “I grew up traveling with my family and as soon as I had money of my own, I was out the door traveling again,” she said. Desiree was working at a start-up she owned in Silicon Valley when she met a girl who crewed on super yachts. When she heard stories of traveling the world with free room and board and other great perks, Desiree could hardly believe that was a real job. She read a book about being a yacht stewardess, sold her company and moved to Fort Lauderdale to get a job on a super yacht. After working as a stewardess for 2 years, she got a job aboard Limitless, the largest American super yacht in the world. It was on board Limitless that she met Jordan, who was working there as a deck hand. Desiree said a big attraction between her and Jordan right away was their mutual love of exploring. “What I had always wanted to do was backpack around the world,” Desiree shared. She hadn’t been dating Jordan long when he shared his dream to sail around the world. “Jordan asked me to sail around the world with him and I thought, ‘hmm, let me think about that one,’” Desiree laughed. The couple decided to test the waters and see how they traveled together by taking a trip backpacking and climbing in Southeast Asia. 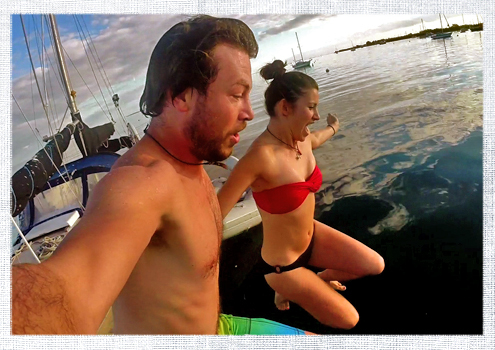 The trip was a success and together they decided to quit their jobs, buy a sailboat and see the world. As they were looking for a boat and preparing to start their journey, they got the idea to document their travels and their process through videos they would share online. “We were thinking of a way to contribute back to society and to motivate ourselves to be creative,” Desiree said. Jordan studied filmmaking in college and Desiree had worked in marketing so they pooled their skills and founded Project Atticus, a travel and adventure documentary series and blog. “It’s really a way to document our travels and to showcase our experiences,” Desiree said. They started on their video series right away, before they even had their vessel. In the first four of their video episodes, you can watch them search for and purchase the boat that will become Atticus. Their boat was a diamond in the rough and needed a lot of work to make her the perfect home for Jordan and Desiree’s world expedition. They are currently deep into a complete refit of Atticus. “It’s taken longer and is more difficult than we expected,” Desiree said of the refit. The pair has been working on their boat nearly full-time for two years now, doing all the work themselves. They decided to DIY originally to save money, but have found that it has added benefits. 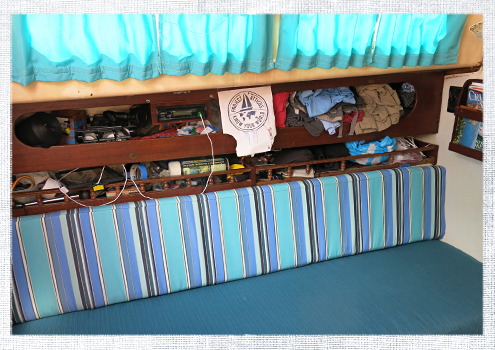 Projects on their list included making curtains for their cabin, as well as sewing new settee and v-berth cushions. While looking for v-berth cushions online, Desiree found Sailrite’s How to Make V-Berth Cushions Video and decided to try her hand at sewing. She got an Ultrafeed Sewing Machine, Sunbrella fabric and set to work on her first project—curtains. 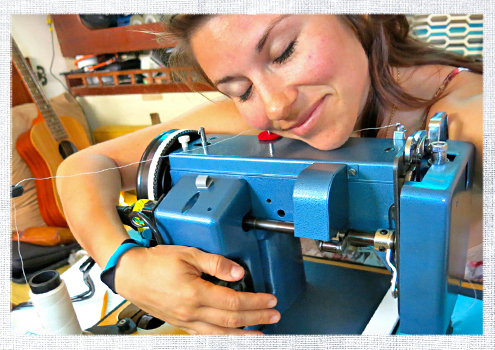 “I was super anxious for sewing and I was intimidated by the machine at first,” Desiree admits. But after her first project, Desiree started to feel differently about her machine. “I used to enjoy the prepping more, but now I enjoy the sewing more,” she said, describing sewing now as being almost a tranquil, zen-like feeling. After completing her curtains and new settee cushions for their saloon, Desiree is now working on the v-berth cushions, which is purposely saved for her third project because she knew they’d be tricky. After that she’d like to make a sail, a sail cover and an awning for their cockpit. While doing her canvaswork Desiree has learned that “there is a lot of finesse in sewing” but she loves the pride that comes from completing her projects. “It’s cool that I really only know the bare minimum about sewing but I can make functional lifestyle projects,” she said. Look at that Ultrafeed love! She has also been really pleased with her Ultrafeed Sewing Machine. After two years working on their refit, Jordan and Desiree have put their hearts and souls into their boat and at time things have been really challenging. Desiree thinks that throughout their refit they have learned valuable skills both about their boat and about life that will help them on their adventure. They’ve had to take odd jobs and learn how to sustain their dream financially (neither is independently wealthy) but Desiree now feels that they will be able to make money anywhere they go to maintain their lifestyle. All in all both Jordan and Desiree feel that their DIY efforts have been well worth it. You can follow along with Jordan and Desiree through their video updates and their blog posts. Visit their website, ProjectAtticus.com to see and learn more.